We wish you a peaceful and fruitful Lent! May God help you get rid of something you want to get rid of. And, also, may it be a fortunate occasion to do something creative that you have wanted to do for so long! We have had several events on our itinerary since Christmas, and we are very happy to share them in the hope they may inspire you! First – we have had an exhibition: Visions of Beauty and 3 icon workshops in Melbourne, – a General one, a Drawing one, and an Advanced one on Assist Gilding. As always there were multiple challenges, for us and for the students, but we hope that the knowledge gained will help all students give more structure to their art in general, and to their iconography in particular. Mainly what we always try to do is this – not only to give our students certain practical skills, but also to provide them with instruments. Instruments for a multifaceted understanding of their global role as artists and iconographers; considerations and contingent guidelines for a professional approach to their work. This is the reason why every year we more and more transform our workshops. Most of them are structured to teach different spheres of iconography, providing a multi-resourced approach to one specific subject at a time. We are glad to share the photographs from these three workshops and, if you have any questions or comments, please feel free to share! 2. Our next workshop is scheduled for June (Wesley Theological Seminary in Washington DC), and it’s a going to be very cool one. Philip is going to teach the ancient technique of True Fresco (Buon Fresco). The main principle is this, – painting is applied over fresh lime-based plaster, with almost all pigments mixed only with water (no binder). Drying lime creates crystals, which grow through the layer of paint, and fix it forever with a beautiful effect of uniform illumination. and just a short note – there are a few spots left and at a special price before the 1st of April. 3. One more important event we should mention was a little exhibition of Olga’s graphic works at the Art Library of Bogolubov in Moscow. There were more than 30 works in different mediums. Some were the images, made for the Calendar (we mentioned these in our previous newsletter), and some were made earlier. We think that works on paper are great because they offer great freedom to learn and use our visual language most effectively. 4. These last month’s assignments were very different from our previous ones, because we were asked to design unique iconostases for 5 different churches here in Russia. Not all of these eventuated as final projects, but Philip has invented an interesting mosaic technique for an iconostasis surface decoration and, in hindsight, considers it a great experience. Composing projects is a specific task, but the process of interaction with clients is a very special one. It was cool overall – we learned how to negotiate, and how to research the best iconostasis for each individual church, choosing from hundreds. Boards have been commissioned, and we hope to share the photographs of those icons in the coming months. 5. Of course, it would only be fair to say, that some of these inquiries only happened because of an interview, published in the popular Russian Orthodox online media “Pravmir”. Philip was interviewed in Russian, then Peter Blackwood inspired us to make it available to an English-speaking audience and, with the help of Alexandra Irini, it was possible to translate it. Click the photograph or the link: http://sacredmurals.com/..interview.pdf to read the interview as a PDF file. Very soon we expect to have another interview. This time with Olga. It has taken several years to finish but we hope it got just got better because of that duration – it’s coming soon! Now, as we have got the most urgent questions answered, work gets back to normal, and we slowly start thinking about possible programs for the next workshops. If you have any special ideas, we are happy to hear from you!! Please let us know what you think are the most important problems iconographers face, and we will try to find the best ways to resolve them together. Hi! I am Natalya German-Tsarkova, the owner of Tzar Travel – www.tzar-travel.com. I am an art history major and that’s why it’s always been a pleasure to share my passion for St. Petersburg with our clients. Our guides share my vision of what a tour should be. They are super qualified, enthusiastic, charming people. We offer visa-free shore excursions for cruise visitors as well as various land tours. email: natalya.german@tzar-travel.com or WhatsApp +7(921)391-18-94. May His peace be always with us! The project continues and different iconographers continue to join it. Let me know if you are interested, – I will give you Sergei’s email (he speaks english well). Now preparing to hold the ones in DC and New York, plus within two weeks we will launch another workshop in Italy. It’s going to be 6-10 September 2018 in Milano, made exclusively for iconographers-professionals and taught in italian. Our latest internet discovery: A very famous illuminated manuscript of X-XI centuries “Menologion of Basil the II” was recently published online by Vatican Library: https://digi.vatlib.it/ . Even though many images depict wild scenes of martyrdoms, it’s a great source of visual information, and may be very useful. For many years we tried to build up a text, which could describe our working process, a “Manual“. Here is a current version of it: http://www.sacredmurals.com/manual.pdf, feel free to download and use it if you like. We hope to update it from time to time, and if you have any enquiries or comments, please feel free to share, – we will consider your feedback very seriously. In the nearest future we will add list of our favourite pigments, – what else should be changed?? Lately we also started to compose a “Bibliography for Iconographers”, as soon as it’s ready we shall publish it too. ANd if you have any of your favourite books, – books or quotations, which you think may be useful, – please share! After numerous recommendations we have opened an Instagram account: https://www.instagram.com/sacredmurals/ and started sharing our photos. Welcome to subscribe, comment, like or dislike :). Shepherds. 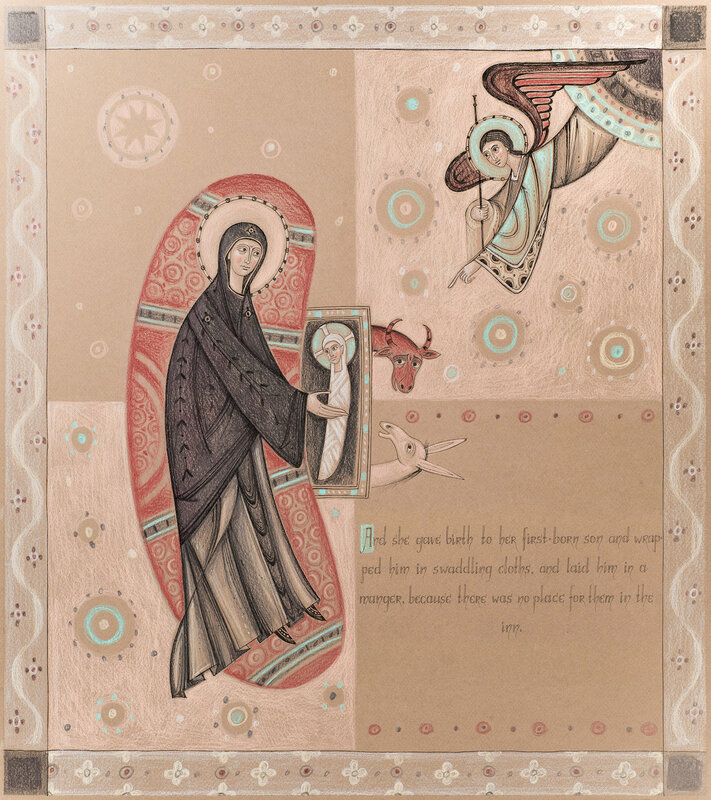 Detail of Contemporary Graphic Series Nativity of Christ. Before sharing news we are proud to repeat our CALL FOR EXHIBITION “Visions of Beauty 2018” one more time: – if you have a possibility to bring your image(s) or object(s) to ACU Visual Arts Building (26 Brunswick st., Fitzroy) about 11 AM on Saturday 13th of January, – please do so! We particularly appreciate large scale works, even though smaller ones are accepted with a great joy as well. Even if we can’t guarantee, that every work will be accepted, we try hard to exhibit all what we can. Nativity of Christ. Contemporary Graphic Series. I doubt anyone likes advertisements in Advent time, so we make it now: we have uploaded all our images of the Nativity of Christ to FineArtAmerica. Some were done in egg tempera, some in colored pencils, the cost of printing dropped for November – December 2017. Some time ago together with other iconographers we were invited to participate a project, called “Saints of Undivided Church” http://saints.artos.org/en/ . Currently there are more then 100 icon painters from different countries and more than 140 icons completed by now. The first exhibition is scheduled to open 20 December 2017 in Minsk (capital of Belarus), it will last till 28 February 2018. Olga’s British Saints and st. Patrick by Philip were accepted and we hope to get some friend’s photos from the opening and 2-day conferences to share. If you are interested, let us know, – we send you a program (in Russian since the whole event will be in Russian as well). At the end of October we have spent 7 graceful days in some old Italian cities, looking at great mosaics and icons. We took some thousands of photos (start sharing them below), but the most romantic moment happened in a pigment shop, which I remember visiting 20 years ago…. And it was still there!!! A cosy “Drogheria” (drug store), on Piazza delle Erbe in Padova selling almost everything, including the pigments… As we entered there, we could not find the pigments at first, but the salesman helped me to remember, where exactly in 1990s I enjoyed so much pulling out these ramshackle boxes with colors. We found them, and shared the fun with the new team. I am speaking about this just to remember Michelangelo, who I heard used to say: “The pigments can be purchased in a drug store”. Visiting Ravenna and looking at it’s stunning treasures we could not stop thinking of showing them to everyone we know. Thank’s God, humans invented cameras and internet! – At least we can share photos and upload them for everyone to see! Feel free to visit our latest Flickr album: https://www.flickr.com/photos/25669502@N07/albums/72157689660467604, – it’s Mauseleum of Galla Placidia. All images can be viewed and downloaded in full resolution (about 4000X6000 pixels). Enjoy! Scholars, designers and web-masters in Utrecht University did a great job, – the website gives unique opportunity to read comments to every scene and detail in more then 180 pages with drawings, possibility to enlarge and download page by page. We downloaded them all and if you like to have them downloaded too, let us know. Forthcoming workshops – very short! All our workshops in Melbourne (Australia) and in Auckland (New Zealand) are full. The New Skete Monastery (NY) – September 25-29. It’s been a long time since we first were asked about an iconography workshop in New Zealand, and here it is! It will take place in Auckland, starting the 5th and ending the 9th of January 2018. We plan to paint an icon of Christ, taking a 13th century image from Mount Sinai as our model. For those, who live in New Zealand, and have already signed up for our workshop(s) in Melbourne. – I don’t mind you shifting to the newer group, but please, do it in the nearest days since the group is filling up quickly, – we have only 5 spots left. We have started a new project, – series of Visual Literacy video-lectures on YouTube. The first one is short (only 3’22): https://www.youtube.com/watch?v=2myJN-yQVPo, but hope it can be a good addition to our workshops, available to everyone. Next one is planned to be about Integrity… What do you think should be other urgent topics? Looking forward to see your comments, likes and dislikes as well :). This time we have no new icons to share, therefore we publish 74 medieval images. These are carved wooden sculptures from Novgorod Museum and Magdeburg bronze doors, which for many centuries work for Saint Sophia cathedral in Novgorod (Russia). All our students and friends, especially those, who come to our Melbourne workshops, are invited to participate our 3rd exhibition “Visions of Beauty 2018” in ACU Gallery Space. The installation should begin on Saturday the 13th of January about midday. We can not guarantee, that all the works will be accepted, but larger ones are preferable. More news in the next Issue!